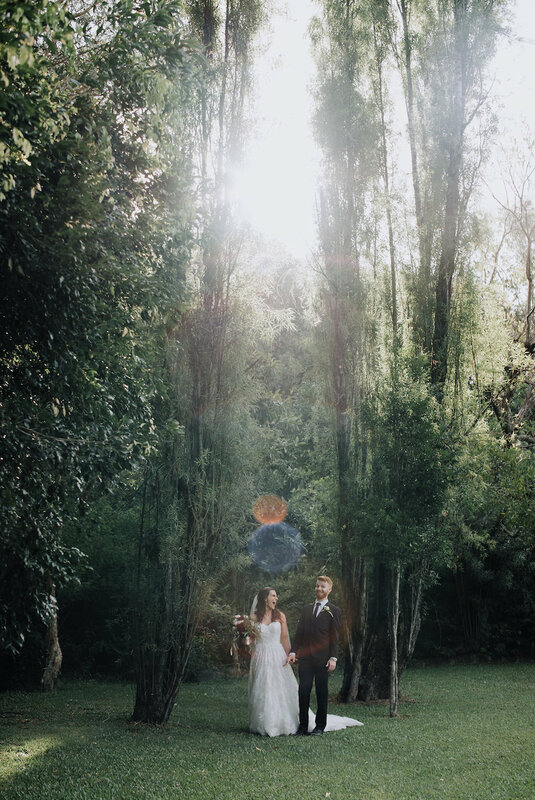 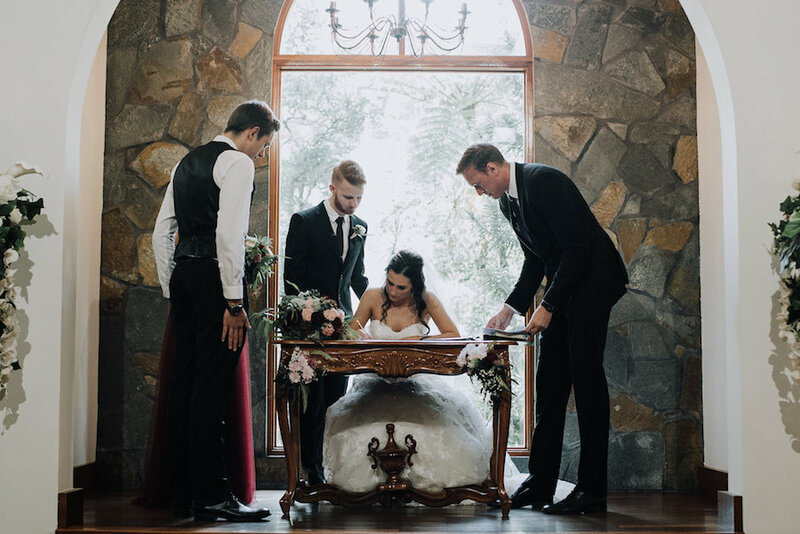 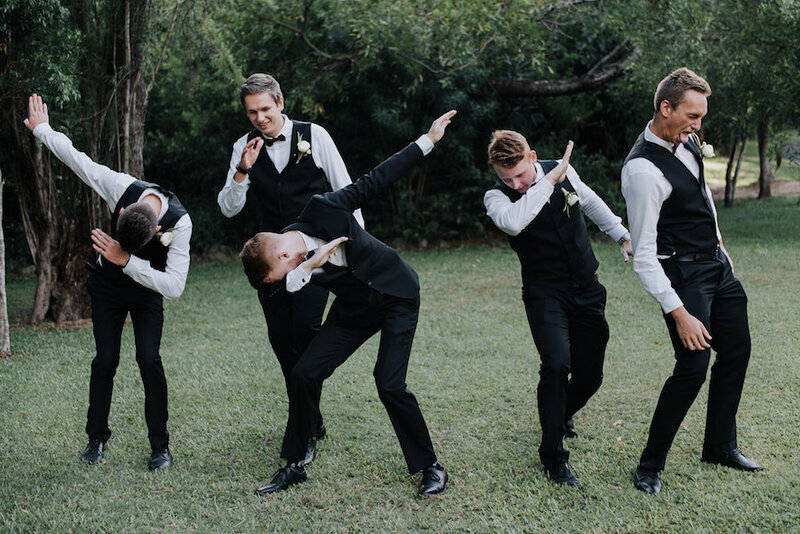 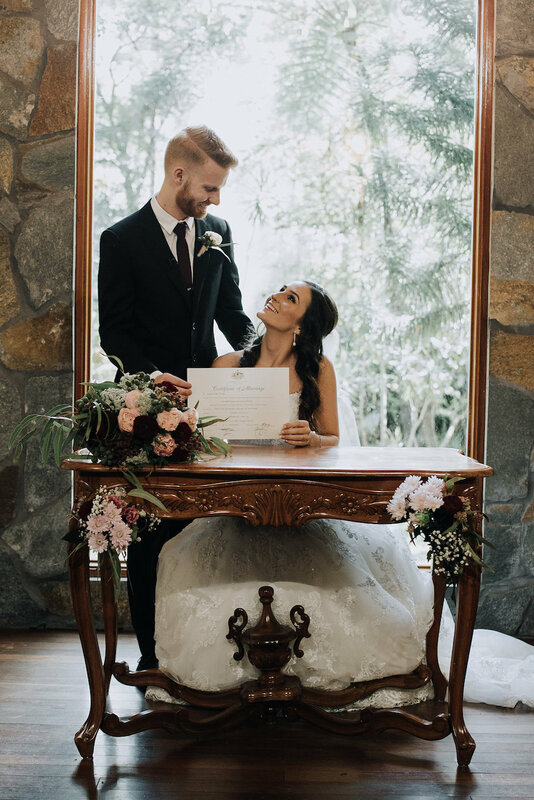 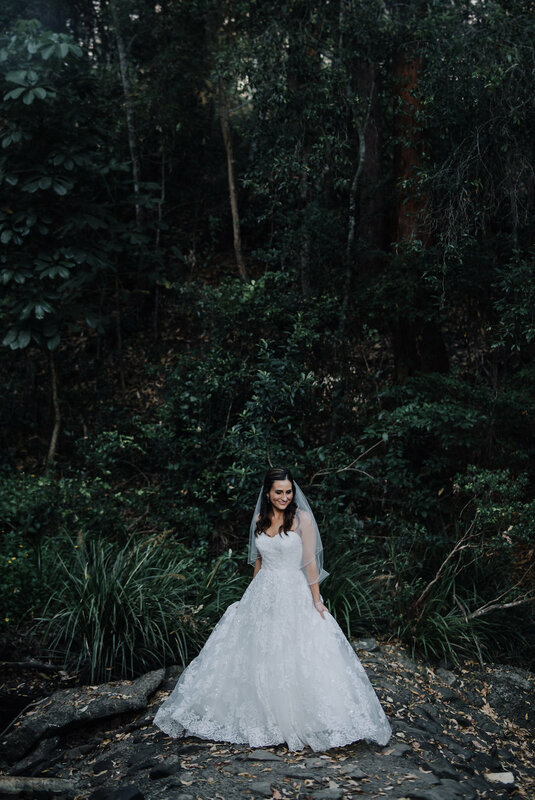 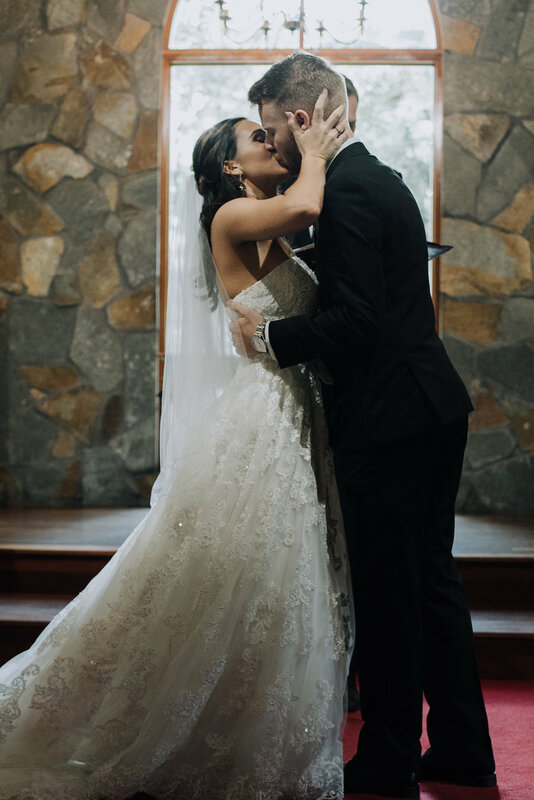 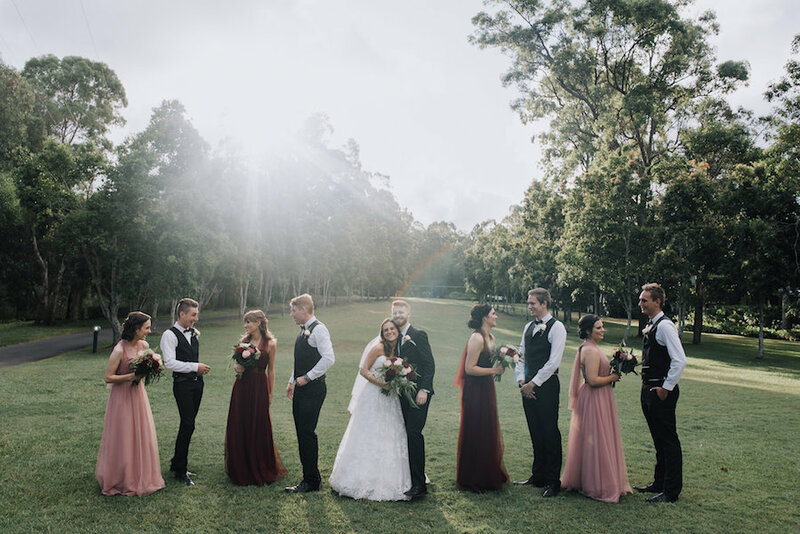 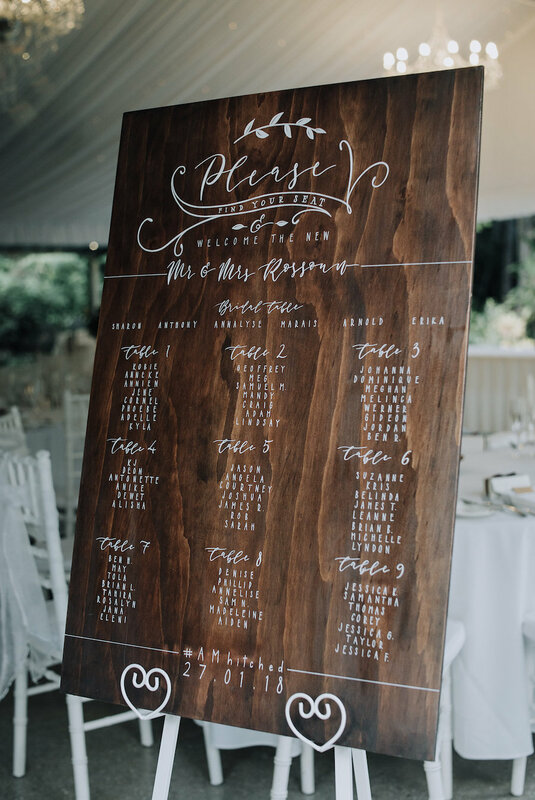 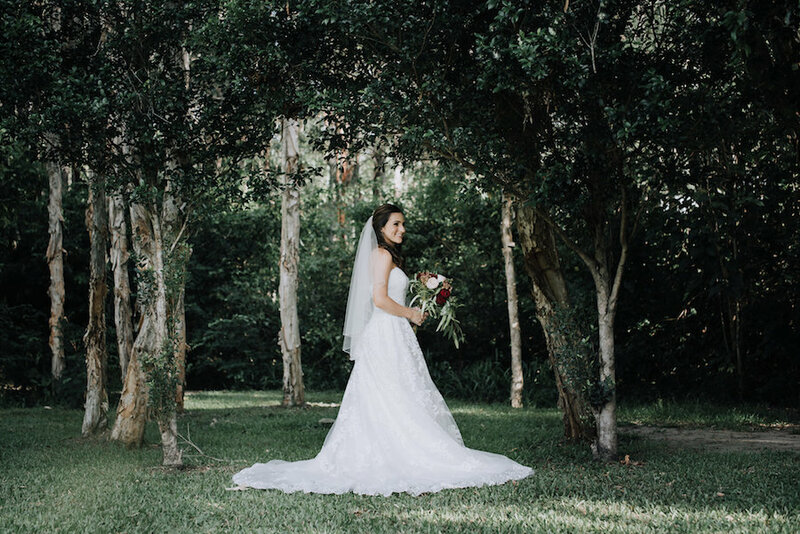 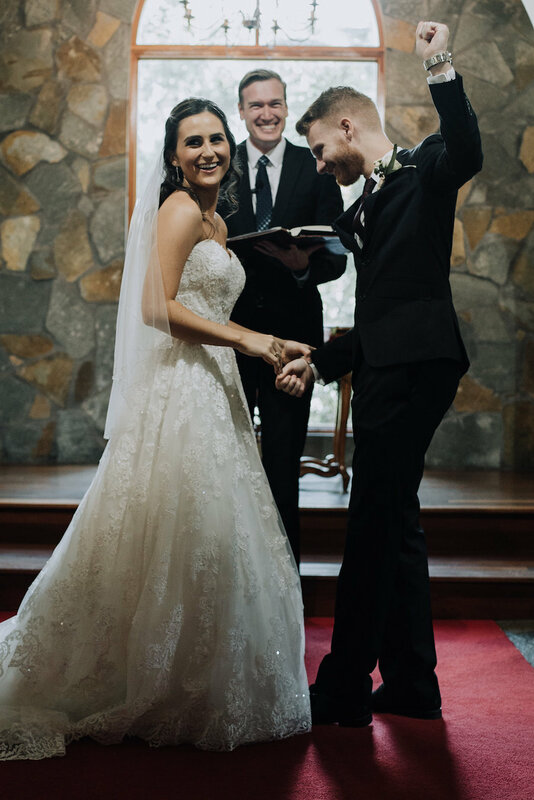 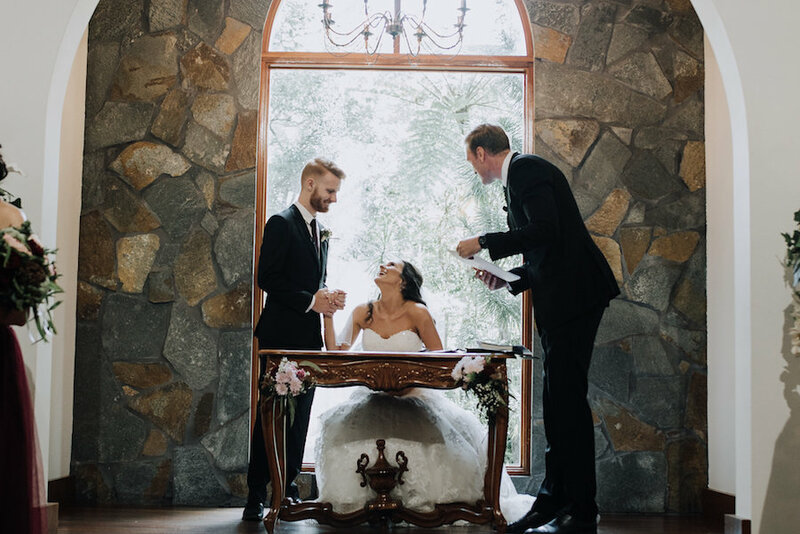 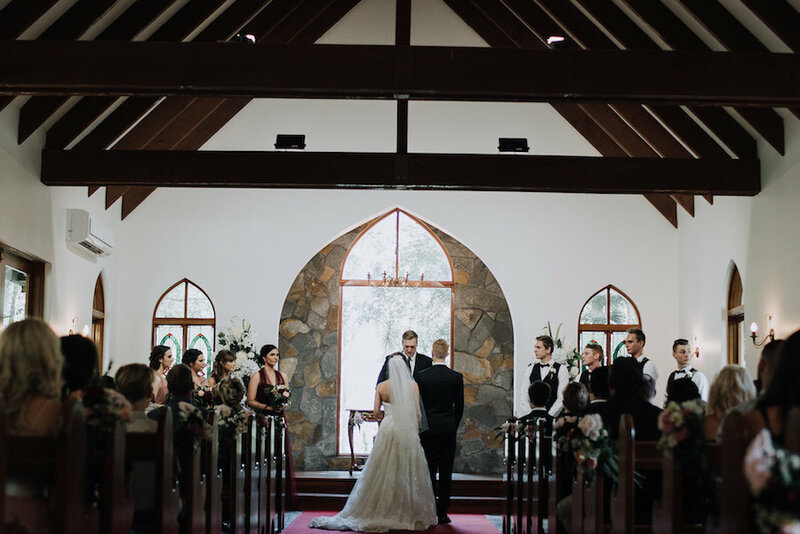 Annalyse and Marais celebrated their nuptials on a beautiful Gold Coast summer’s day at our secluded hinterland wedding venue, surrounded by 70 of their closest friends and family. 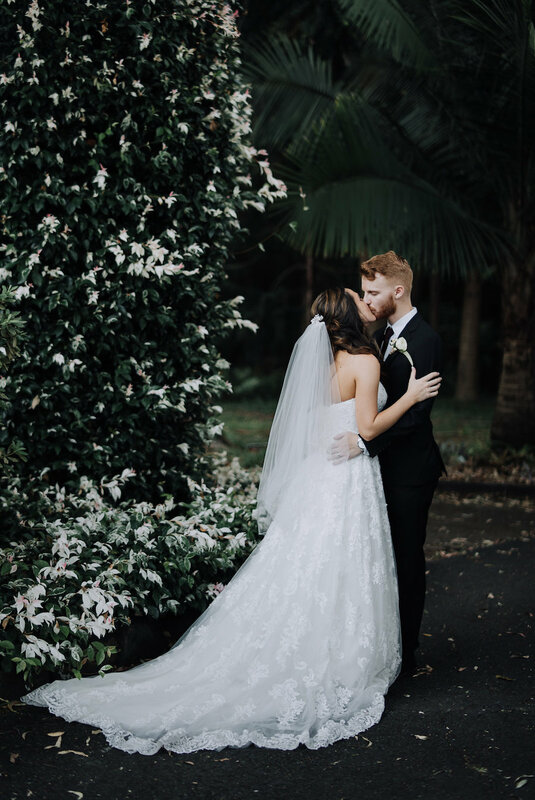 Their day was an incredible celebration of love and commitment, complete with a soft pastel colour palette, personalised signage, gorgeous blooms and picturesque garden surroundings. 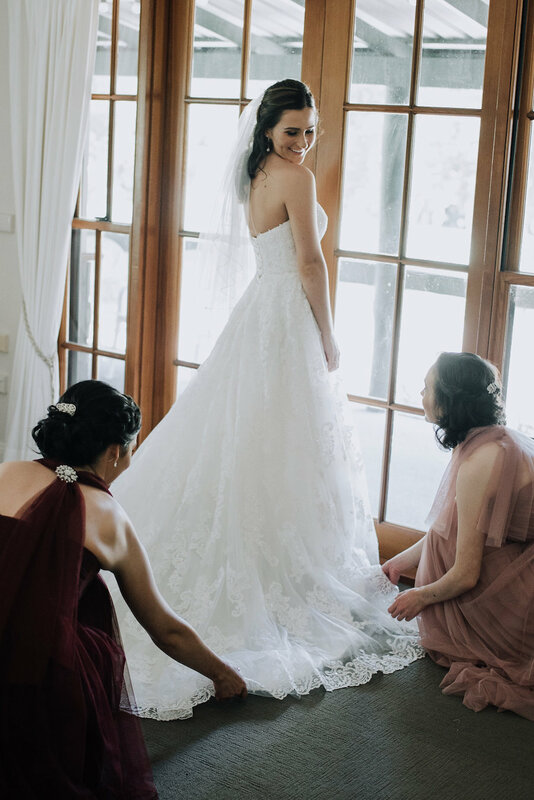 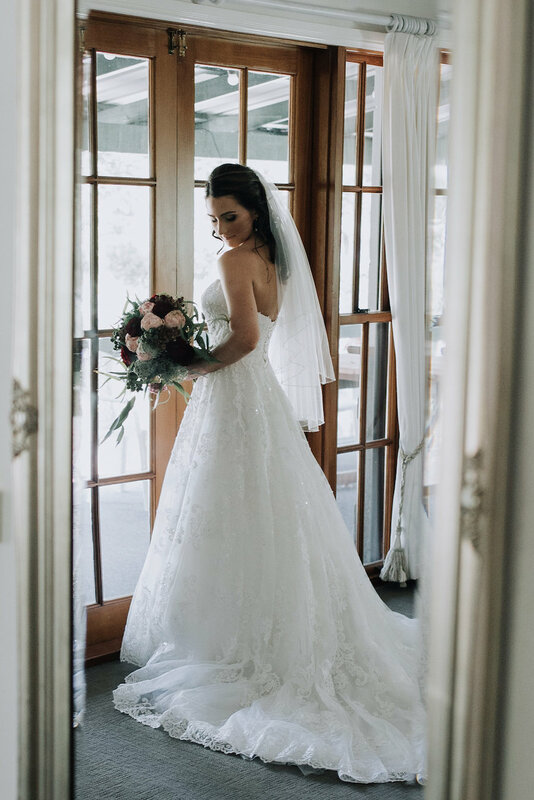 Annalyse and her maids spent the morning at our homestead accommodation preparing for the day, with our beautiful bride looking stunning in a white lace gown. 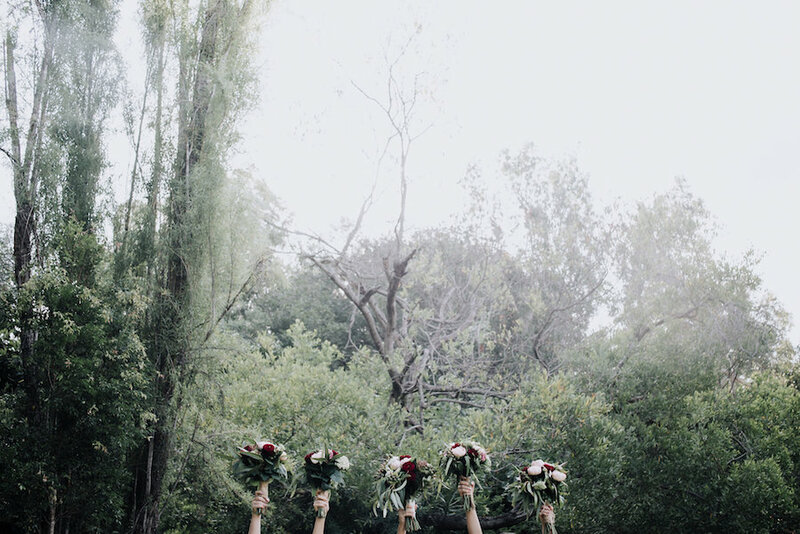 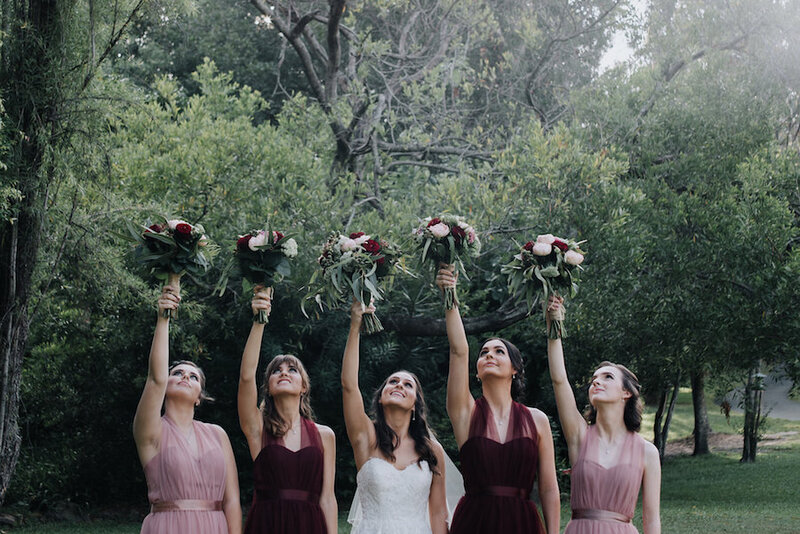 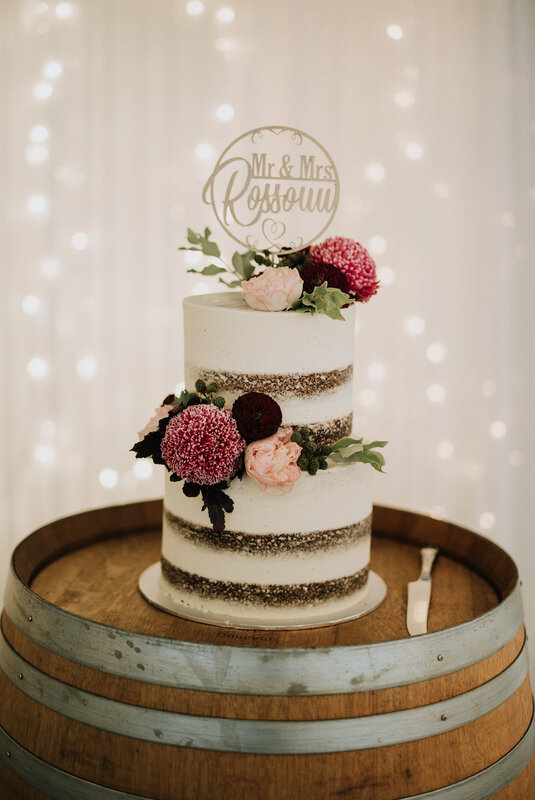 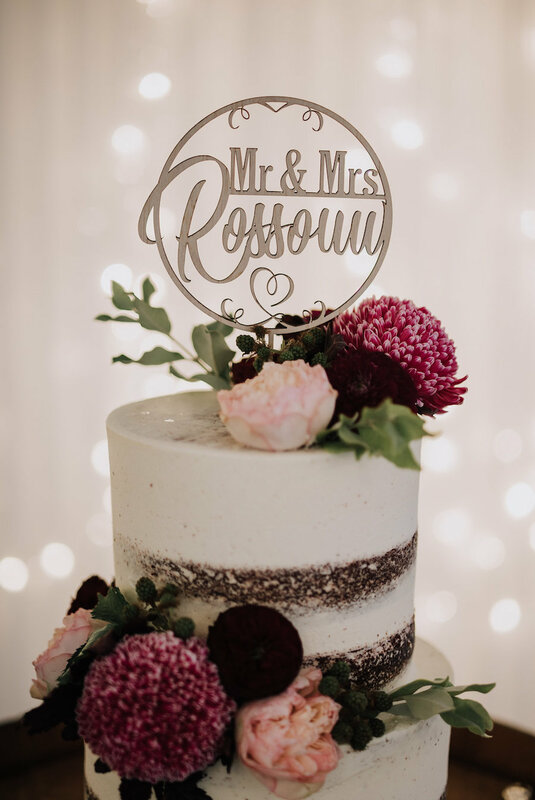 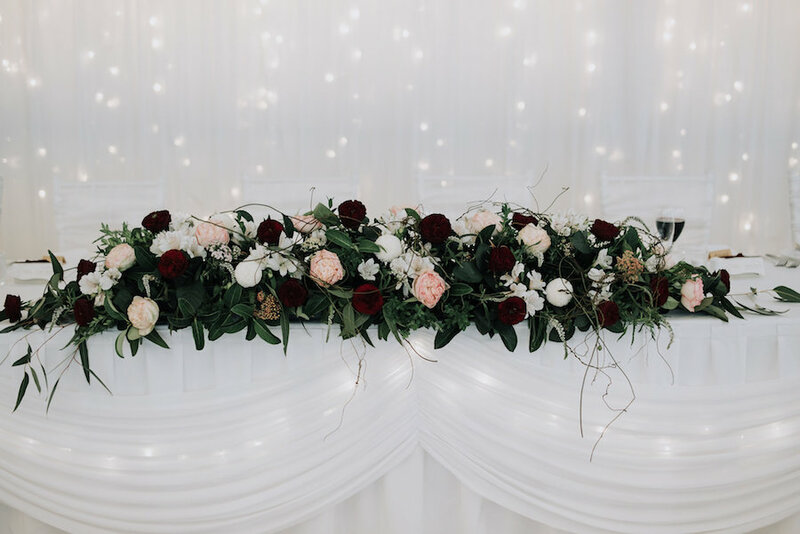 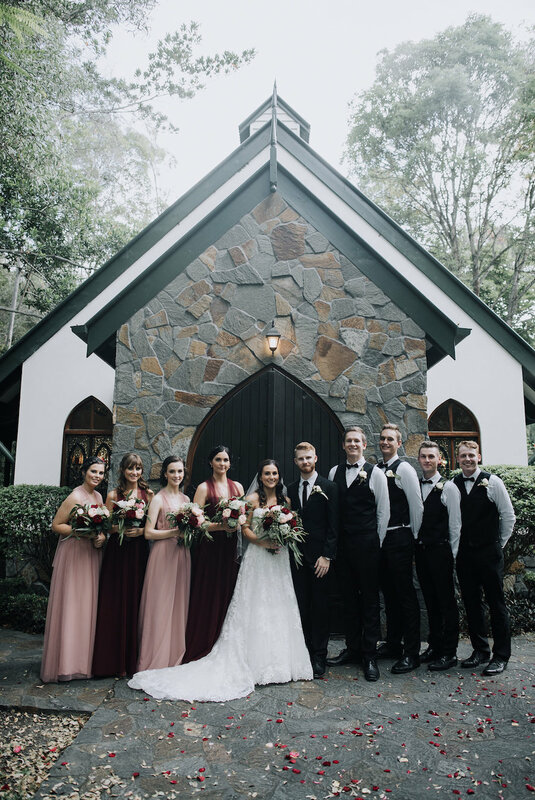 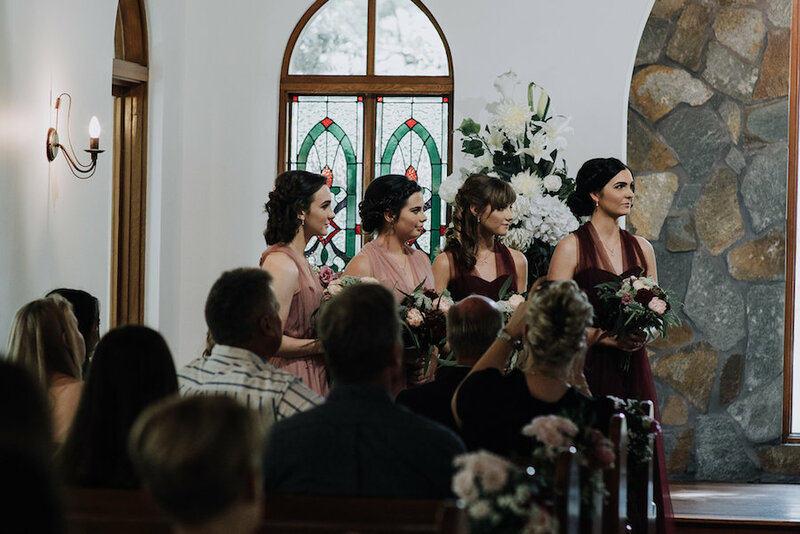 These two lovebirds then exchanged vows in our sweet stone chapel, adorned with fresh floral arrangements in shades of blush, green, burgundy and white. 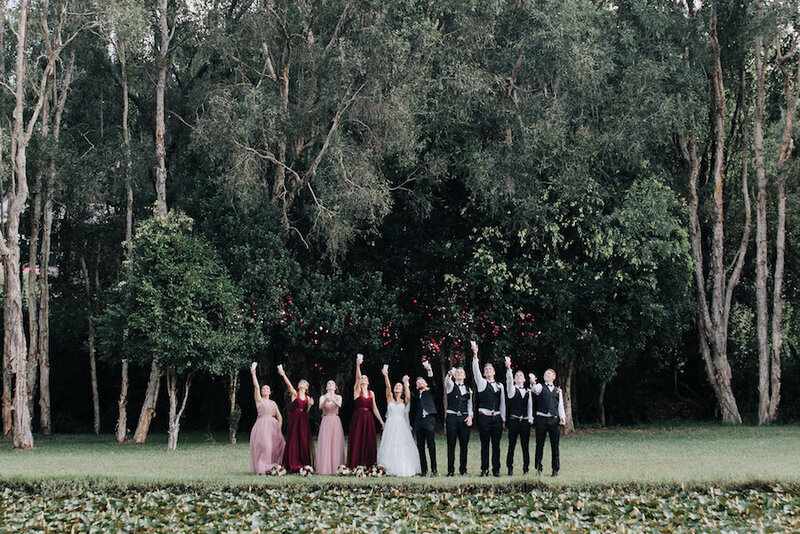 Following their ceremony, guests enjoyed drinks on our verandah while the bridal party took advantage of our stunning lily pond, lawns, love swing and private gardens for some fun-filled wedding photos around the estate. 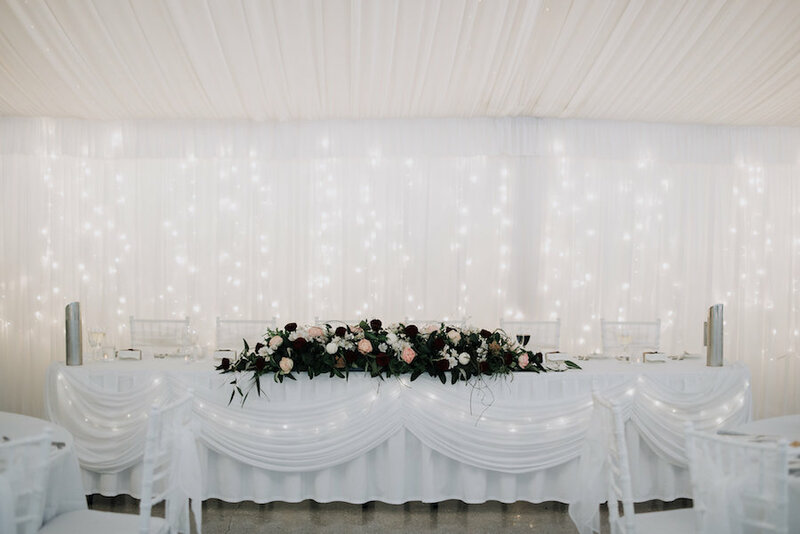 Inside their marquee reception, a simple yet elegant setting was styled with our round tables, white tiffany chairs, soft draping and twinkling fairy lights. 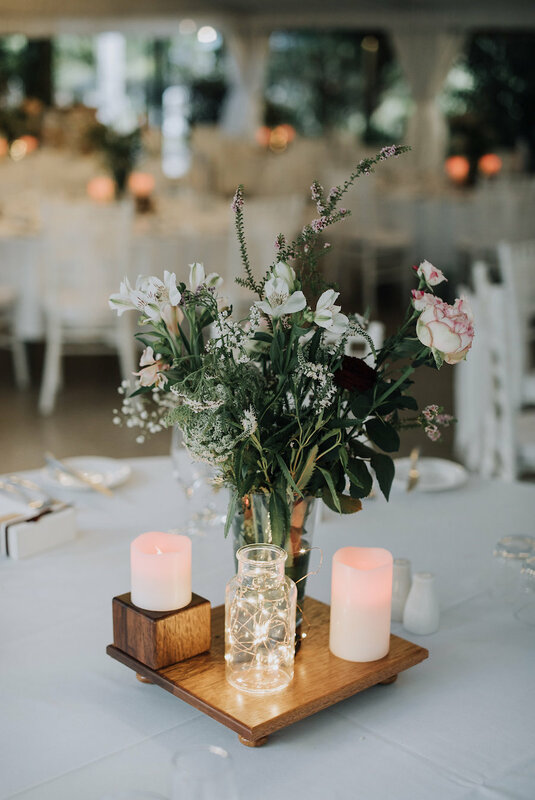 Centrepieces included beautiful floral posies atop wooden boards, with glowing candles to create a warm and romantic atmosphere. 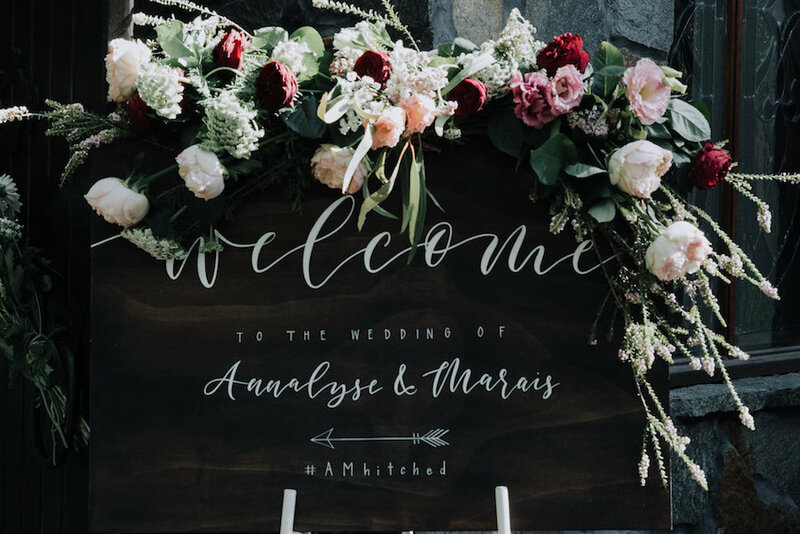 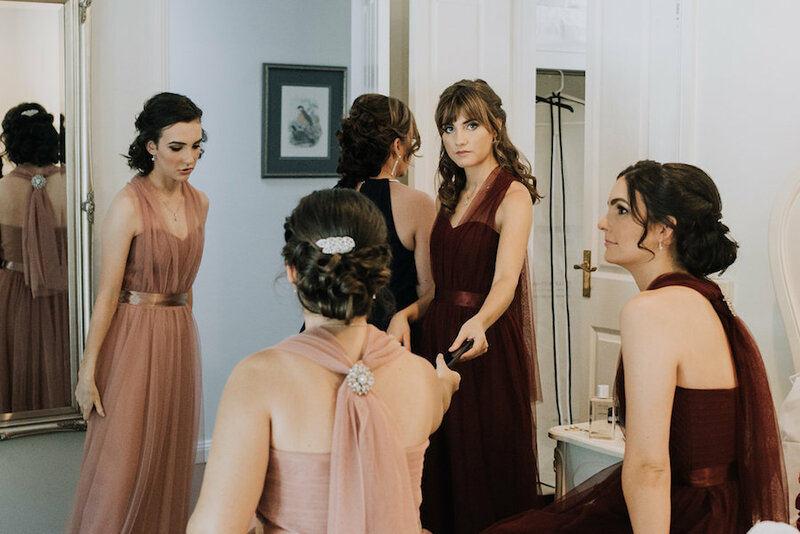 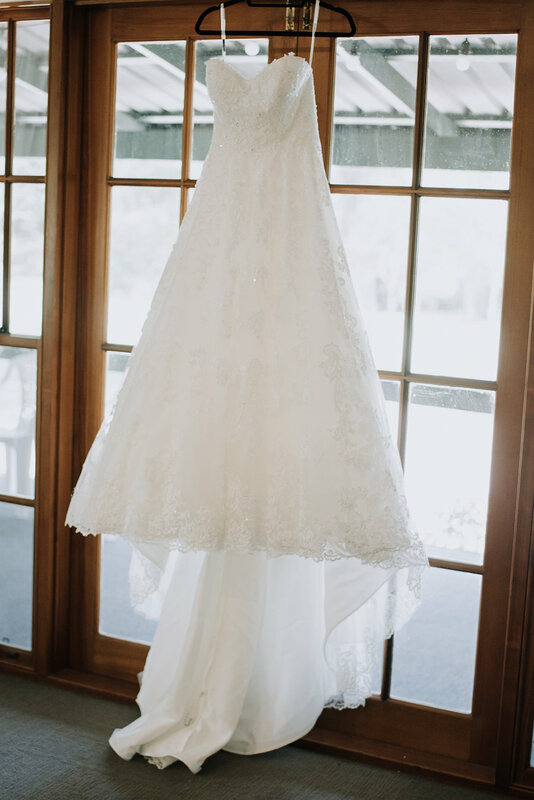 We couldn’t be happier for Annalyse, Marais and their families – see more from their gorgeous day below, captured by our friends at Mad Rose Films! 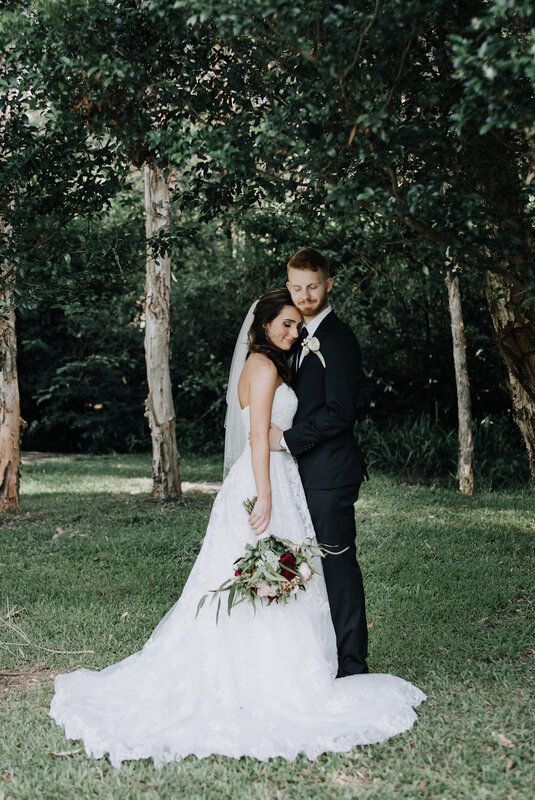 A huge congratulations to the new Mr and Mrs Rossouw! 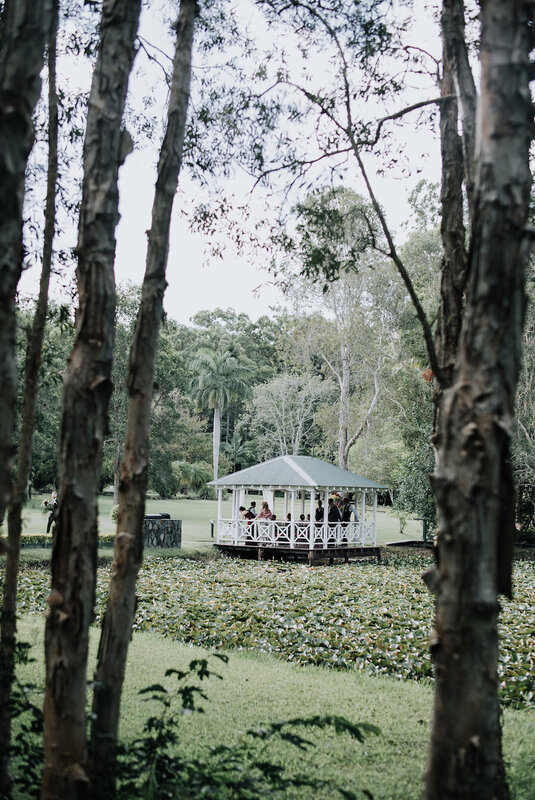 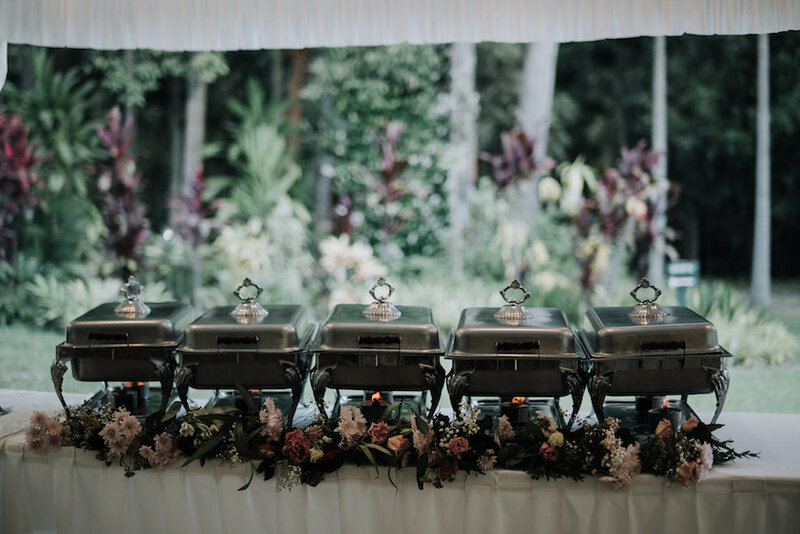 If you’re currently searching for the perfect garden wedding venue on the Gold Coast, we’d love to hear from you. 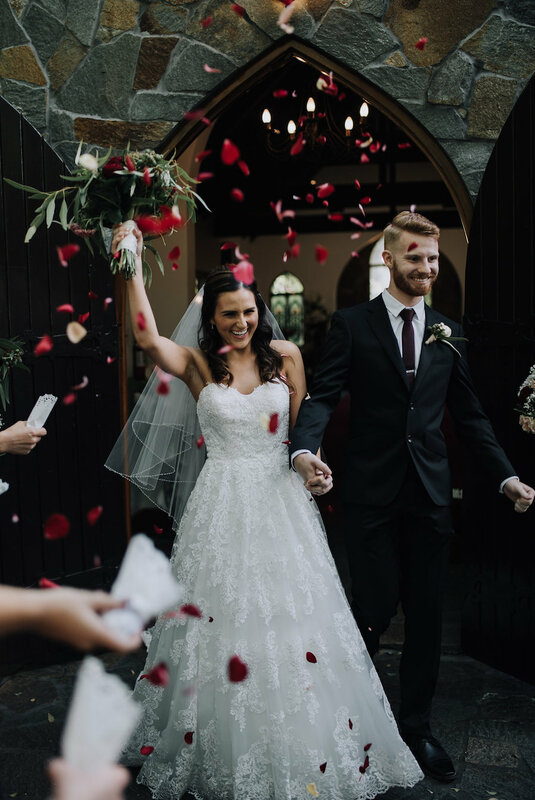 Book in for a bridal appointment, or get in touch to learn more about our wedding packages. 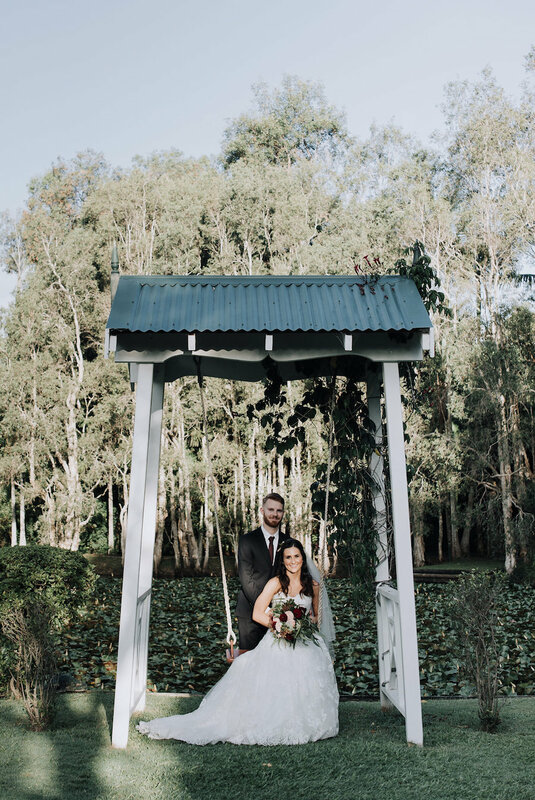 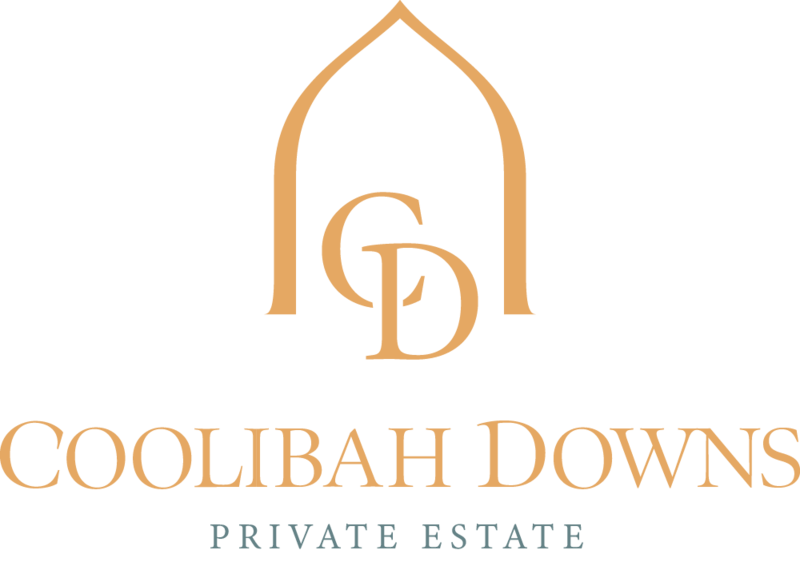 We’re currently offering a special promotion for Summer weddings here at Coolibah Downs – learn more about planning the perfect Summer wedding right here, or ask us about our latest wedding specials upon enquiry!